For once Tony Stewart was speechless. "Can you get Danica to just stop coming by the media center every week, while she's running so bad," the reporter asked with a straight-face, and to be honest, seriously. Ol' Smoke simply didn't know what to say. If you think this Danica Patrick story line is a bit strained, week after week after week of "learning," well, you're not alone. But don't feel that sorry for her, because she is getting a lot of money to play this NASCAR game...even if this season she is playing at it rather poorly. Yes, she was finally doing something worthwhile on the track, the other day up in Montreal, leading the race....until she ran over a shoe. It looked great on television. And when she had to pit for repairs right after that, well, it was looking easy to blame it on the shoe. Of course the shoe had nothing to do with it. And she finished woefully again. It's like a broken record. Yet NASCAR's relentless marketing machine again here Friday marched her into the press center for another series of pointless questions and answers. Still Patrick handles it all gamely. 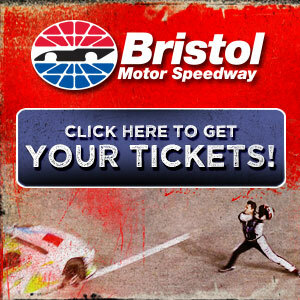 And she is braced - we think -- for a double-header weekend here, running in Friday night's Nationwide 250 and Saturday night's Bristol 500. 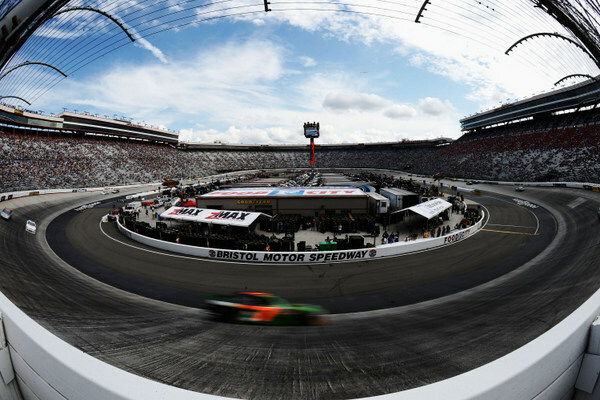 On Bristol's 'new' layout -- the upper groove of the three-groove parabolic banking has been ground down several degrees so drivers can't do the Harry Gant routine and run up to the wall. How much the new layout will do for these two events is of course unclear. What track owner Bruton Smith hopes is for a lot of beating and banging, the stuff that made this the hottest ticket in NASCAR. Smith says he expected at least 130,000 here Saturday night, in this vertiginous stadium. And when the economy picks back up, Smith says he expects more 160,0000-seat sellouts, like in the good ol' days. But then Smith -- and he's not bashful about it either -- would like for these drivers to start roughing each other up and playing mean and tough, and yell and scream a little too. Patrick, well, she's a bit in awe of this place, as well she should be. Bristol Motor Speedway is one of the wonders of the sports world, especially at night. Patrick was actually looking decent at Montreal, after that first-lap-out at Watkins Glen. But the shoe incident has made her the punch line. "The Austin Powers 'Who throws his shoe at me, really?' is probably the most appropriate thing," she deadpanned. "It's disappointing. We were looking forward to having a shot to win. We were just looking at having a good result. "I can't tell you how many people said after Watkins Glen what bad luck I have. And then I hit a shoe. "So I don't feel like it can get a lot worse. "I'm ready for it to turn; I'm ready for some good luck. I'm ready for some good results. "The team has been working extremely hard....it's nice to get rewarded with a good finish sometimes. I think we are all looking forward to that." But probably not here this weekend. Friday night will be tough enough. And Saturday night will be her first Sprint Cup race at this dramatic half-mile. That's 250 laps Friday night, hopefully, followed by 500 laps Saturday, hopefully. Don't even think about her winning. Certainly she's not: "Finishing all the laps is the most important thing for me. "To get that seat time, and feel how the track changes, as well as get use to the distance and work on the car throughout the race..
"There is always a rhythm to a race, and you have to get a feel for that by doing the whole thing." Perhaps adding a twist to this weekend, Goodyear has different tire setups for Friday and Saturday. Stewart, Clint Bowyer, and Jeff Burton tested Cup tires in June. While the Cup right-sides are the same as race here in March, the left-sides are different, though teams have raced them at Richmond the past two years. The new left-side pick is designed to give the Cup cars more grip. Track boss Bruton Smith has been pushing Goodyear hard for 'softer' tires here, for better racing. 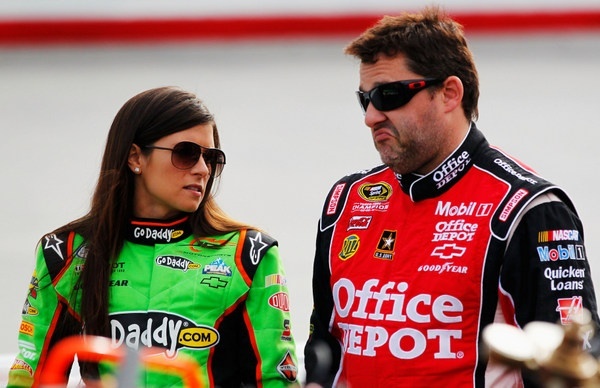 But is this Danica Patrick in NASCAR project really working? "At this point it's about gaining the experience," she says. "What doesn't kill you makes you stronger. "I've just got to focus on staying positive. "I can't remember having this much bad luck in forever. I don't ever remember feeling like you just can't seem to catch a break...."
Submitted by Tennetexan on Sat 08/25/2012 - 06:03. Submitted by Nate Holman on Sat 08/25/2012 - 09:20. She finishes top 10 at Bristol. Get off her case. IRL drivers in NASCAR have traditionally been slow starters. This is her first full Nationwide season and first PT cup. Did anyone really expect or declare that she would come in and put the boys over her knee? If she ever indicated that, I missed it. Submitted by Fireball Roberts on Sat 08/25/2012 - 19:23. What success warranted her getting a good ride in Nationwide or Cup? She had 1 IRL win. 1. Most all of the other Indy drivers that have came over at least had a title or many wins as their credentials. All of Danica's credentials are on display in Maxim, and that's about where the talent ends for her. She's just another high-profile seat taker. Give someone a shot that has actually proven themselves in a stock car, either in Cup or at a lower level. Submitted by Al Torney on Sat 08/25/2012 - 15:11.